Kye and Britt haven’t been to Disney since Britt’s first trip last February. Our Disney talks had even faded it’d been so long! Zach and I LOVED going in the winter time last year. February was such great weather and such low crowds so we decided to take another trip there this year around the same time. Our Disney trip rotation has been 1 BIG trip every few years for the youngest child’s first visit then 2 small trips every year in-between the big ones. We just go to the park for one day on the short visits and it works out really well! 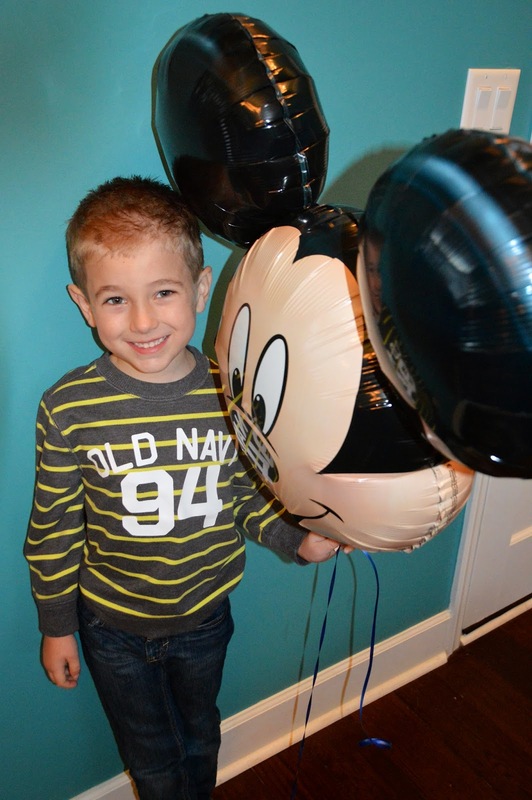 Kye celebrated his birthday at Disney last year and it was really great. 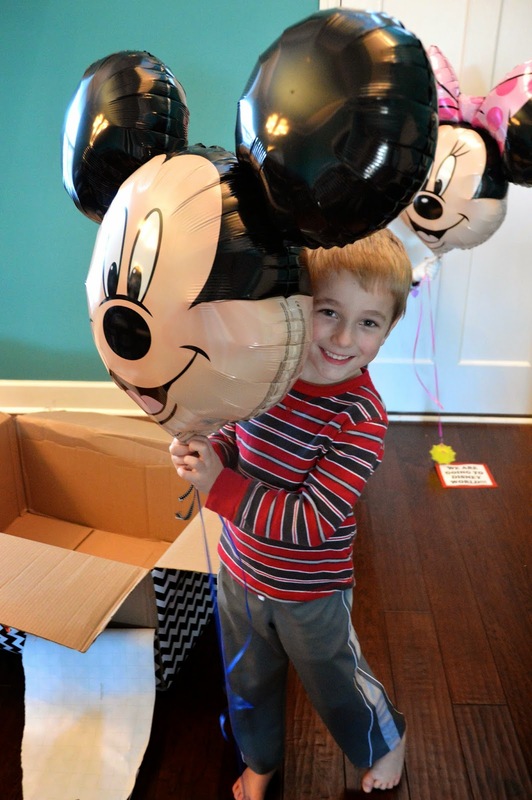 We were already going to Disney so we just incorporated his birthday into our plans and used his party money towards doing a couple extra special things while visiting the parks. We had talked to Kye about what he wanted to do for his birthday this year and he actually said he wanted a party rather than another Disney trip. So we decided to make our trip a super short quick one since we wouldn’t have his party money to make any extra stuff happen 😉 Basically just go down, spend the night, go to the park, sleep, then come home. We also decided it’d be fun to surprise the kids with the trip. Kye thought since he chose a party over a Disney birthday that it meant he wouldn’t get to go back to Disney until he turned 7 (he says he wants a Disney birthday then). We knew he’d be SO surprised to get to go to Disney! I hunted around for ideas on how to tell the kids about the trip. 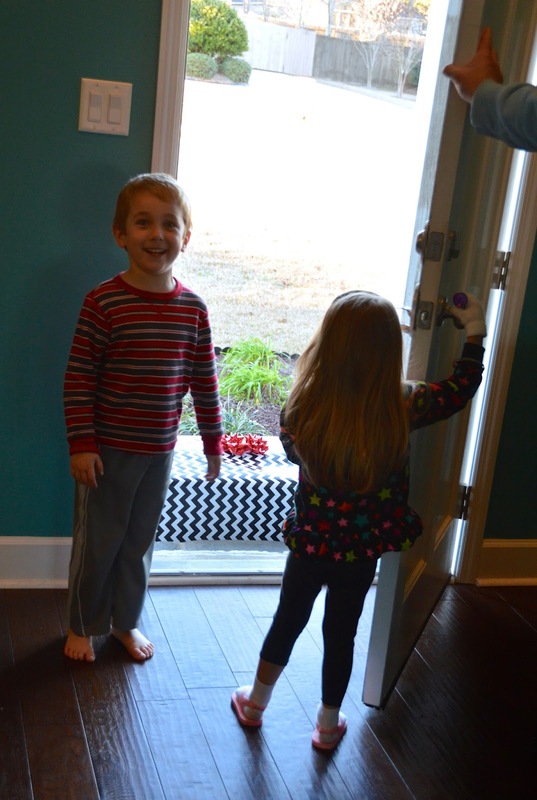 We surprised Kye a couple years ago and it didn’t quite meet what we had been anticipating, remember? This time we decided to go a different route on the surprise. I actually hunted around like a crazy woman to have a special phone call take place from Mickey telling the kids where they were going. 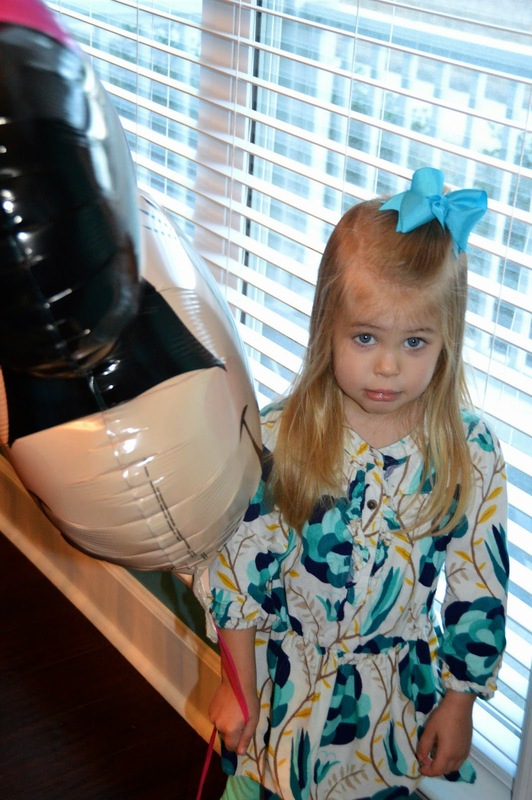 I found this blog post (and random sidebar but I’ve become fast friends with the blogger!) and did pursue having the phone call happen but then decided to go a different route. We may go that route at some point though! We were both pretty pumped for the kids to find out so we decided to tell them a little sooner than we’d originally planned. I like anticipating a trip and the kids do too so by telling them a few days prior to leaving it allowed for the best of both worlds! 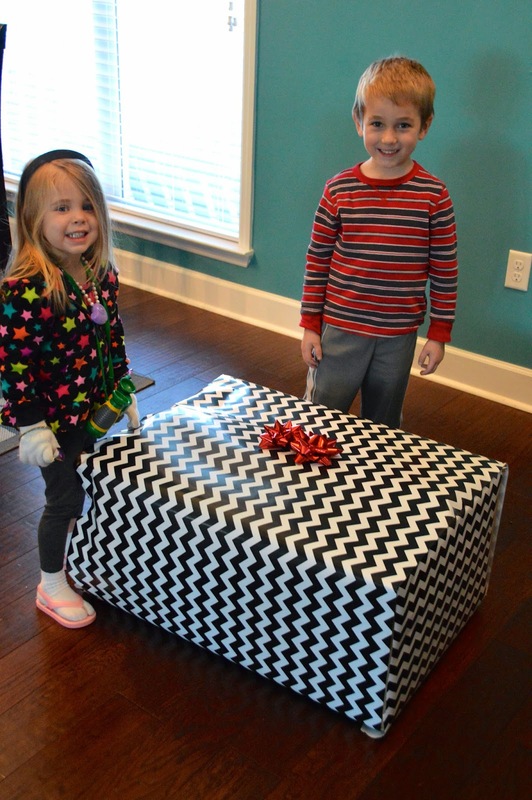 Then we switched and I went upstairs and Zach ran and rang the doorbell and got back inside before we got down to answer the door 🙂 They were SHOCKED to see a big present sitting there! We took a couple more pics the next day too! The kids were excited right away, but the excitement def built up more and more in the days leading to the trip! I am SO happy with how the surprise turned out! I kinda wish we would have told them separately. Because Kye can read and I loved that he was able to read the sign and I loved watching his face as he realized what it meant. But Britt was WAY too into the balloon to even understand what was happening 😉 She reminded me of when we surprised Kye last time! 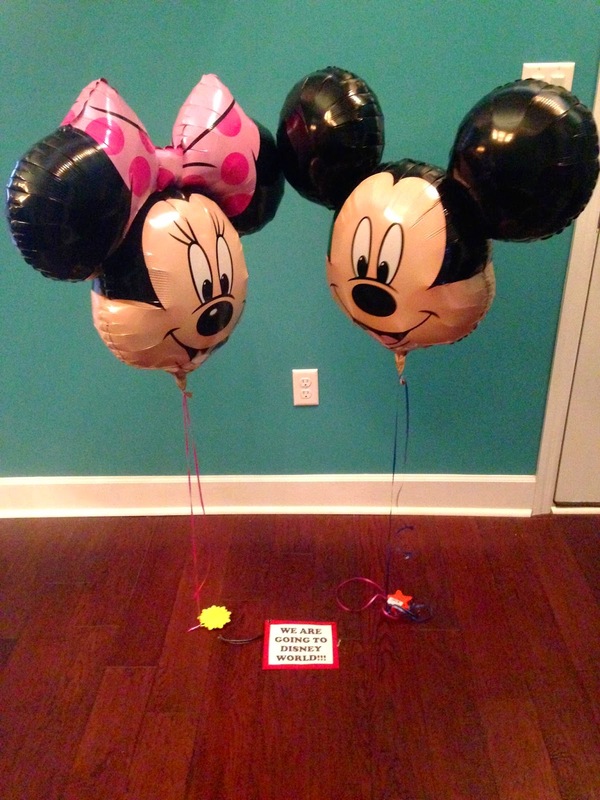 I’m sure this won’t be the last time we surprise them with a Disney trip! 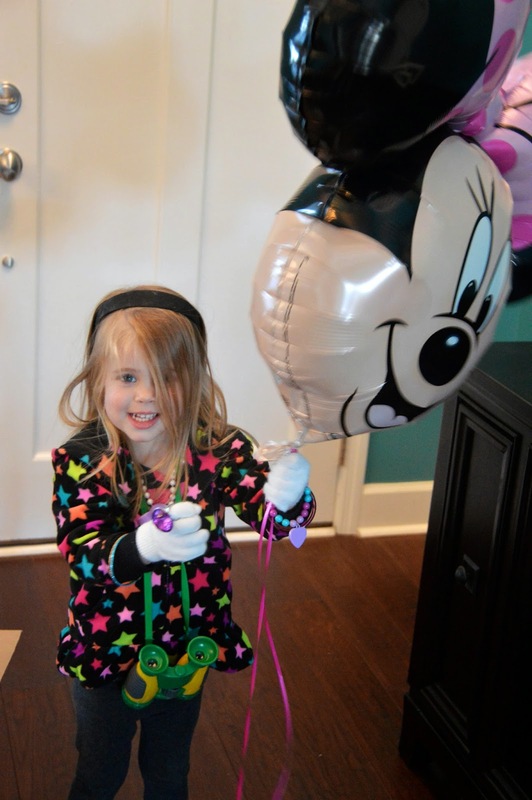 Have you surprised your kids with a Disney vaca? I’d love some ideas of ways to surprise them in the future!